More than 4 million commercial robots will be installed in over 50,000 warehouses by 2025, according to a report by ABI Research. The 50,000 figure represents a massive expansion of the market from the current situation in which an estimated 4,000 warehouses were found to be using robots in 2018. ABI says the rapid rate of adoption will be driven by the need for flexible, efficient, and automated e-commerce fulfillment as same-day delivery becomes the norm. Global adoption of warehouse robotics will also be spurred by the increasing affordability and return on investment of a growing variety of infrastructure-light robots as they are an attractive and versatile alternative to traditional fixed mechanical automation or manual operations. Nick Finill, senior analyst at ABI Research, says: “Flexibility and efficiency have become primary differentiators in the e-commerce fulfillment market as retailers and third-party logistics companies struggle to cope with volatile product demand, seasonal peaks, and rising consumer delivery expectations. Automated guided vehicles and autonomous mobile robots goods-to-person systems can directly replace heavier mechanized automation that typically requires massive upfront investment and rigid physical infrastructure. Robots enable the optimization of space in expensive warehouse facilities and can reduce the need for new and costly greenfield fulfillment centers. Mobile robotic systems also offer major flexibility advantages. 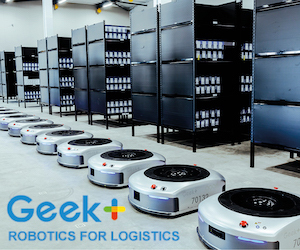 Robot vendors, such as Fetch, Geek Plus Robotics, and inVia, enable additional robots to be added to or removed from a fleet as operational demands require. They also allow easy and relatively rapid reconfiguration of entire workflows and operations if product lines or fundamental operational requirements change. This is a major advantage in the unpredictable and dynamic e-commerce market, says ABI. The researcher adds that, as a result of impressive innovation in computer vision, artificial intelligence, deep learning, and robotic mechanics, robots are also becoming increasingly adept at performing traditionally harder-to-automate tasks. Economically viable mobile manipulation robots from the likes of RightHand Robotics and Kindred Systems are now enabling a wider variety of individual items to be automatically picked and placed within a fulfillment operation. By combining mobile robots, picking robots, and even autonomous forklifts, fulfillment centers can achieve greater levels of automation in an efficient and cost-effective way. 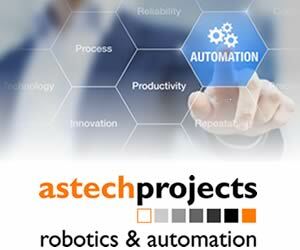 Many robot technology vendors are providing additional value by offering flexible pricing options. Robotics-as-a-service models mean that large CapEx costs can be replaced with more accessible OpEx costs that are directly proportional to the consumption of technologies or services, improving the affordability of robotics systems among the mid-market, further driving adoption. Finill says: “By lowering the barriers to adoption for robots in the warehouse, vendors are disrupting the wider logistics value chain. These findings are from ABI Research’s study, Robotics in E-commerce Fulfillment application analysis report.